Centers for Medicare & Medicaid Services (CMS) officials say they will tell Medicare contractors not to process any physician Medicare claims for the first 10 business days of July because Congress failed to block the cut in payments to physicians. A reduced supply of human rabies vaccine nationwide has dictated a change in the way the physicians obtain the vaccine for patients who likely have been exposed to rabies. Upcoming changes to Medicare regulations may impact the way you prescribe for patients covered by the Medicare Part D program. Will you be in compliance? Protecting the 2003 tort reforms and the presidential campaign's impact on the future of health care are on the agenda for the 2008 TMA Fall Conference on Saturday, Sept. 6, at the Hyatt Regency Hotel in Austin. Physicians, patients, and regulators around the country are increasingly up in arms over how health insurance companies set “usual, customary, and reasonable” (UCR) charges to determine payments for out-of-network services. The Centers for Medicare & Medicaid Services (CMS) published proposed new rules affecting Rural Health Clinics (RHC) and Federally Qualified Health Centers (FQHC). The Centers for Medicare & Medicaid Services (CMS) selected Elena Armstrong to be the Medicare durable medical equipment, prosthetics, orthotics, and supplies (DMEPOS) Competitive Bidding Program ombudsman for the Dallas-Fort Worth-Arlington area. The Texas Medical Association Political Action Committee (TEXPAC), the political action committee of the Texas Medical Association, sent this letter today to U.S. Sen. John Cornyn (R-TX). Dear Senator Cornyn: The Texas Medical Association Political Action Committee (TEXPAC) is outraged that you made the decision to follow the direction of the Bush Administration and voted to protect health insurance companies at the expense of America’s seniors, those with disabilities, and military families. See "Tell Cornyn and Hutchison Their Vote Was Wrong"
TEXPAC speaks on behalf of more than 43,000 Texas physicians and medical students, and nearly 8,000 alliance members. Organized in 1962, TEXPAC is one of the oldest political action committees in Texas. TEXPAC also is one of the largest bipartisan PACs in the state and ranks first in size among other state medical association PACs. Doctors face a 10 percent cut in Medicare payments next week, following the Senate’s failure on Thursday to take up legislation that would have averted the cuts. Sadly, Senators Cornyn and Hutchison both voted "no," on a measure that failed by one vote. More to come. July 1 is only two weeks away, and Congress has not taken final action to stop the cuts in Medicare fees paid to physicians that are scheduled to take effect then. The Physicians' Foundation for Health Systems Excellence (PFHSE) national survey of physicians can now be accessed through the TMA Web site. Ask a Librarian for help! As a TMA member, you don’t need to spend countless hours researching a patient's diagnosis. Let the TMA Knowledge Center do it for you for free or very little cost. Do you use health information technology (HIT) in your practice? What about other Texas physicians? You can find out by reading a special TMA survey on the subject. The Texas Medical Association and a Texas pharmacy chain have teamed up to avoid headaches for you and for your patients who need their Medicare and Medicaid prescriptions filled. The 2008 annual meeting of the American Medical Association House of Delegates completed its business and closed up shop a day ahead of schedule Tuesday, something even the old-timers in the house said they had never seen happen before. The session was missing some of the fire and contention that had marked recent house gatherings. The delegates calmly considered and debated new AMA policies and elected a new slate of leaders. A moving opening address from AMA President Ron Davis, MD, who was stricken with pancreatic cancer midway through his term of office (watch a video of Dr. Davis' speech). The house adopted policy to strongly oppose the Hospital Acquired Condition—Present on Admission (HAC-POA) law, developed new guidelines on international medical tourism, said it would be a "grievous error" for President Bush to veto a bill that increases physicians' Medicare fees if it pays for that increase with cuts in subsidies to Medicare Advantage plans, and adopted new strategies to address medical students' growing educational debt. AMA published its first National Health Insurers Report Card. Study the penalties for using health savings accounts for nonmedical purposes. The house also adopted a Texas proposal to have AMA support state legislation that would make it a felony for a person to misrepresent himself or herself as an MD/DO physician. "Patients need clear and evident protection from individuals masquerading as an MD or DO physician," said Dallas dermatologist Dan McCoy, MD, who developed the proposal. Two more leaders of Texas medicine impressed themselves on the national organizations this week. Jessica Nguyen-Trong, a third year student at The University of Texas Southwestern Medical School, was reappointed to the American Medical Association Council on Legislation. Jessica already has served as an intern with U.S. Rep. Michael Burgess, MD (R-Lewisville), and has been a member of the TMA Council on Communication and the Council on Health Promotion. She's got quite a future in politics! And Mia Price, the indominable immediate past president of the TMA Alliance, was elected to the AMA Alliance Nominating Committee. What was originally scheduled as a campaign event turned into a Sunday-evening victory celebration for two Texas physicians who already have secured their spots in the pantheon of American Medical Association leadership. TMA planned its traditional chili-and-fixins' reception to promote Jim Rohack, MD, in his race for AMA president-elect and Sue Rudd Bailey, MD, who was running for the AMA Council on Medical Education. Both physicians won their races uncontested at Saturday's session of the AMA House of Delegates. Hundreds of physicians from around the country flocked to the Texas reception to congratulate Drs. Bailey and Rohack. Spouses of the Texas delegation members ladled up the chili and (virgin) maragritas -- with and without salt. Check out the slide show of Texans' celebrating their magnificant victories. Jayesh Shah, MD, has won election as vice chair of the American Medical Association International Medical Graduate (IMG) Section. 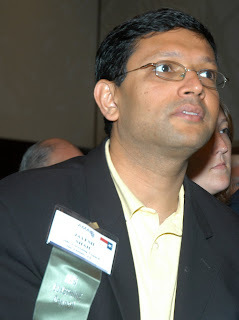 Dr. Shah, a San Antonio internist, has long been an active leader in the Texas Medical Association IMG Section. Sue Rudd Bailey, MD, today was unanimously reelected to a four-year term on the American Medical Association Council on Medical Education. "I pledge to continue to represent the voice of the practicing physician," Dr. Bailey told the AMA House of Delegates. Jim Rohack, MD, who has been a leader in organized medicine since he was a medical student in Galveston, was unanimously chosen president-elect of the American Medical Association today. Dr. Rohack, a cardiologist from Temple, Texas, will be installed as the 164th AMA president next June. 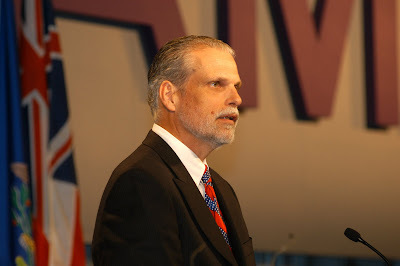 Under his leadership, Dr. Rohack pledged, the AMA will be "clear, focused, and forceful" in advocating on behalf of American physicians and their patients. Sue Rudd Bailey, MD, the chair of the Texas Delegation to the AMA, nominated Dr. Rohack for office. "In everything that Jim does," she said, "he's always the best prepared, always has the deepest understanding, always has the highest standards, and never, ever forgets his love for the medical profession and the physician-patient relationship." Dr. Rohack, a former TMA president, is senior staff cardiologist at Scott & White Clinic in Temple. He is a professor in both the Department of Medicine and the Department of Medical Humanities at the Texas A&M Health Science Center College of Medicine. He is treasurer of the board of commissioners of the Joint Commission. He also chairs the National Advisory Council to the Agency for Healthcare Research and Quality and is one of the principals of the Hospital Quality Alliance. Congratulations to Reid Orth. The third-year medical student from The University of Texas Health Science Center at San Antonio won reelection as vice chair of the American Medical Association Medical Student Section. Medical students from the University of Texas-Houston swept the top two awards at the American Medical Association Medical Student Section. 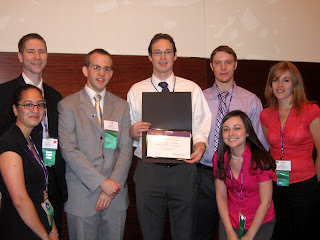 UT-Houston was named Chapter of the Year, and UT-Houston medical student Spencer Pruitt received the 2008 Leadership and Excellence Award. Spencer Pruitt, a medical student from the University of Texas-Houston, is the new chair of the AMA Medical Student Section, Region 3. Congratulations to Dr. Buckingham and Spencer. More election news on Saturday. Susan Rudd Bailey, MD, a Fort Worth allergist, is running for reelection to the AMA Council on Medical Education. 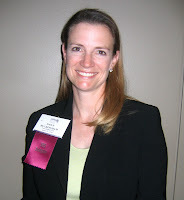 Dawn Buckingham, MD, an ophthalmologist from Austin, is seeking to become chair-elect of the AMA Young Physician Section. Reid Orth, a third-year medical student at The University of Texas Health Science Center at San Antonio, is running for reelection as vice chair of the AMA Medical Student Section. This installment of Podcast TMA features an interview with Dr. Jim Rohack, a cardiologist from Temple, Texas, and a former TMA president. Download the show. Dr. Rohack is the only announced candidate to be the next president-elect of the American Medical Association. If all goes as expected, on the afternoon of Saturday, June 14, the AMA House of Delegates will elect him to that post unanimously. Just about one year later, he will become the 164th president of the AMA. (By the way, we'll be blogging from the AMA meeting, June 14-18. Watch this space for news on Dr. Rohack's election and coverage of all the issues.) We talk with Dr. Rohack about why he wants to be AMA president and what he hopes to accomplish. We explore AMA issues and projects that would attract more Texas physicians to the fold. And we discuss what attracted him to leadership positions in organized medicine and why others should be interested as well. TMA's Risk Management Audio Seminars give you and your staff important information on issues that could pose a liability risk for your practice. A reminder to members that the Physicians’ Foundation for Health Systems Excellence (PFHSE) is conducting a national survey designed to give physicians a voice. The Centers for Medicare & Medicaid Services (CMS) has posted on its Web site a new educational resource to help physicians comply with the Physician Quality Reporting Initiative (PQRI). The Third Court of Appeals has left the podiatrists without a leg to stand on in their ongoing battle to expand their scope of practice.